Since history is written by the conquerors, sometimes the conquered require a little backstory. With that in mind, Hellboy fans can get a sneak peak of Hellboy II: The Golden Army with an animated version of the Hellboy II prologue comic that Dark Horse gave out at this year's Wondercon, in which Dr. Bruttenholm pacifies a young Hellboy on Christmas Eve by telling him a cheery tale of interspecies war. Watch the clip for world-dominating humans, genocidal machines, and an adorably miniature version of our favorite hellspawn, under the jump. 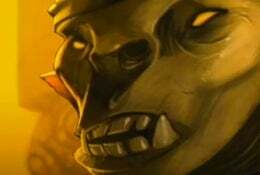 Written by Hellboy creator Mike Mignola from a story by Mignola and Golden Army director Guillermo Del Toro, the animated six-minute short comes in advance of the movie's July 11th release date. And if you're wondering where the young Hellboy came from, you can always see his origin story.